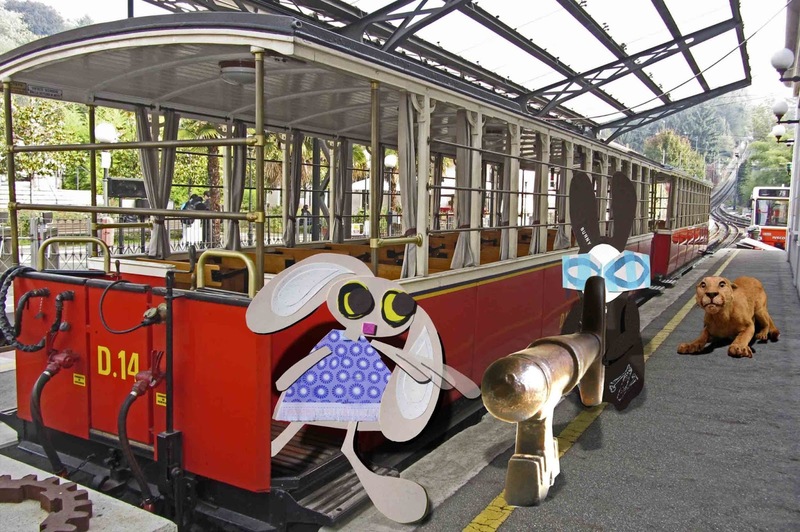 The key pulled the Wabbit all the way to the funicular railway and as it proceeded down the platform it began to glow slightly at the end. The Wabbit’s paws were glued to the key by a strange magnetic force and he could only hop along with it. But just as he got to the front of the train, Lovely Lapinette got off. "Oh, hello Wabbit, I wasn’t expecting you!" Then she stopped and stared. "What’s with the gigantic glowing key, Wabbit?” The Wabbit shrugged. "Is this one of your tricks?" she sighed. "No trick," said the Wabbit brightly. "He’s got himself stuck to the key," purred Puma, "and it’s taking him somewhere." 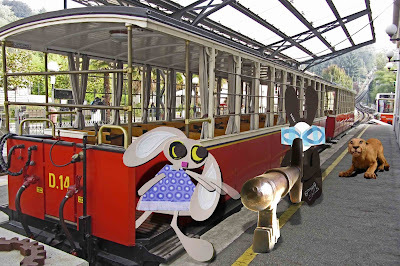 The Wabbit’s paws were getting tired and again he tried to pull them from the key but to no avail. The Wabbit gave a wry smile. "We’ll find out in due course," he said with optimism. "Shall I try to pull it off?" said Lapinette, hopping down from the step. She stretched forward and held out a helpful paw. "No!" cried the Wabbit and Puma at one and the same time. Lapinette had only stretched in the direction of the key, but some irresistible force gripped her and propelled her forward. "Grrrr!" said Lapinette, shaking a paw that was now stuck fast to the key. "Too late," growled Puma.